People often opine that once you introduce transit into a community, economic improvement/economic development automatically results. This is emphatically not true. A number of preconditions need to be in place, or programs in place to specifically leverage the transit as it is introduced, in order to truly reap _potential_ benefits. The light rail has been in operation in Baltimore City since the early 1990s. 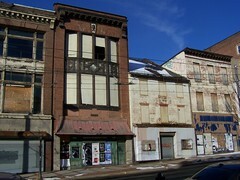 Much of Howard Street still languishes, despite the 18 years the service has been in operation.